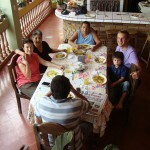 This is my last day in Copan. Saul and Isly from World Vision just stopped by with a present for me. It touched my heart as it is really me that thanks them for hauling me around all week and putting up with my terrible Spanish. I feel like these gifts are really not for me but for all those people that supported the El Malcote school project. It is all such a combined effort………people that donated money, Robert and Darcy who looked after getting the money down here, World Vision and Ellen who did the REAL work here to get the classroom built, the community people who volunteered their time and muscles to actually build the building. 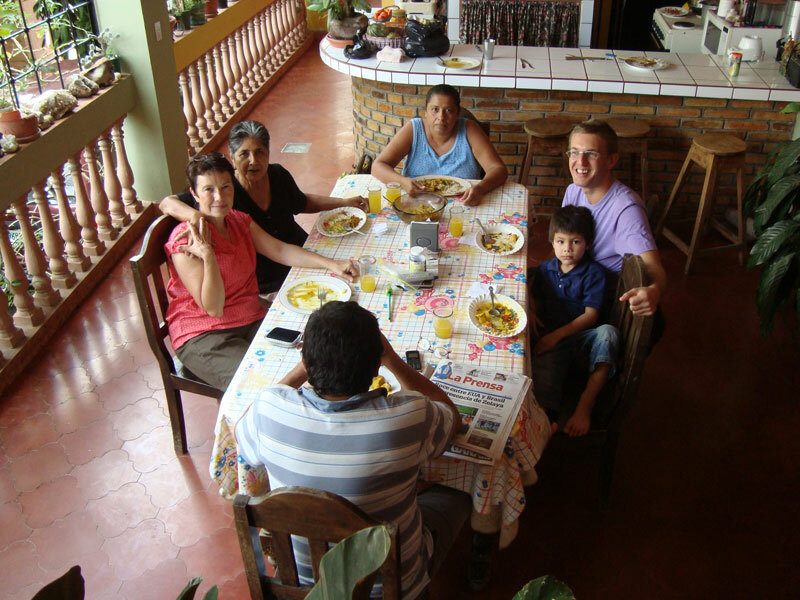 Robert puts up my blog faithfully every day, Barry looks after the homefront, the dog (and now a cat too), Telma my friend and hostess here in Copan. Telma still “knows everything” and is an ongoing supply of accurate information. 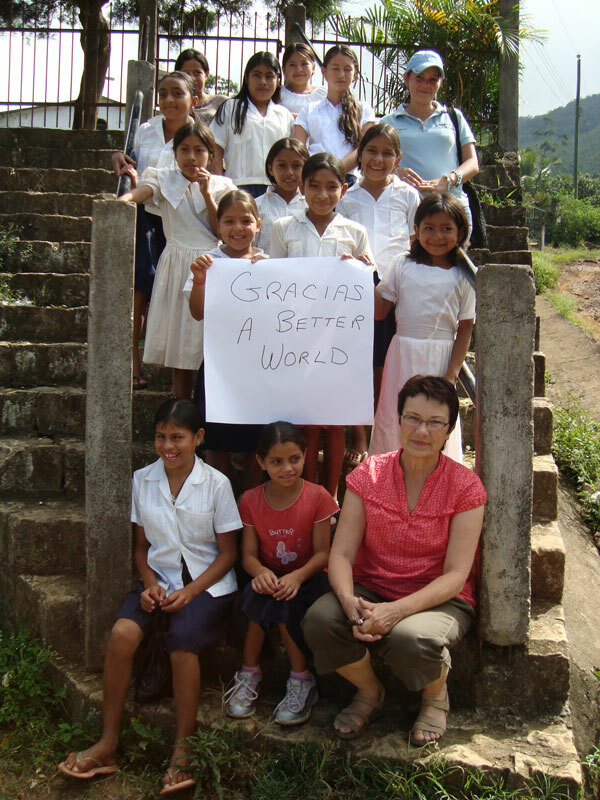 And I am grateful to “A Better World” who supplies the organization that I can work through. I’m just waiting for the lady who is buying the food for the orphanage and then will go with her to deliver it up there. And- that will be my last task for this trip. 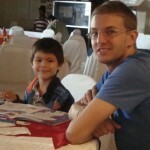 I was in Guatemala today! 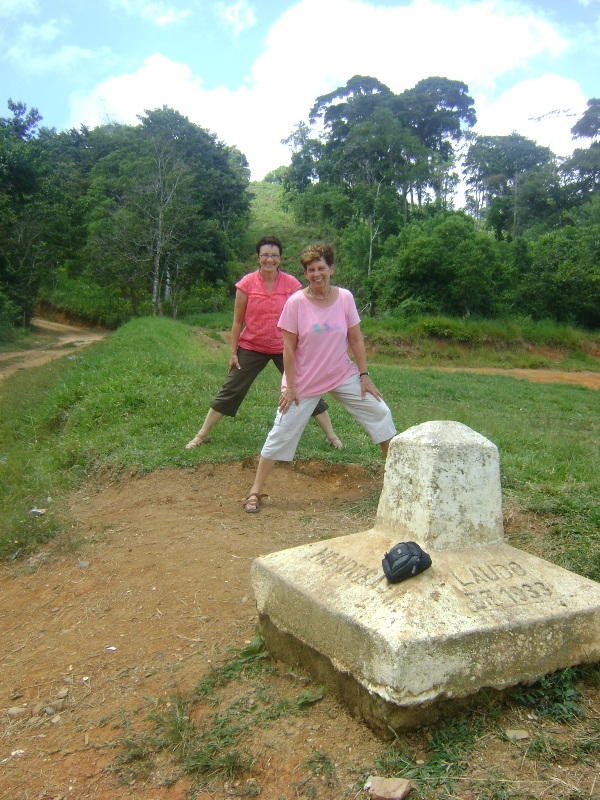 This is Ellen and I with one foot in Guatemala and one foot in Honduras. 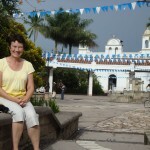 We went to Santa Rosita and Los Arcos (about an hour and a half on very bad roads from Copan). These two communities are next in line for new classrooms. 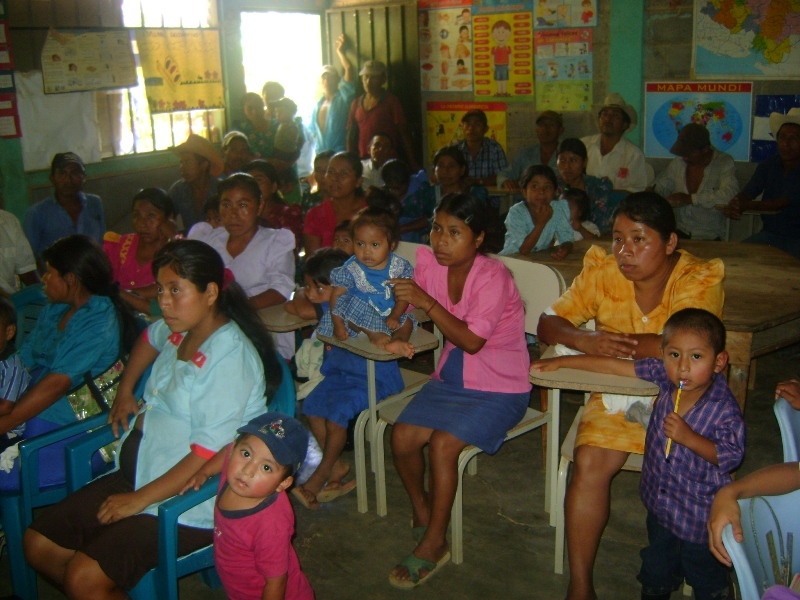 There was a community meeting to see if there was enough interest to complete the classroom with volunteer labor. Immediately after the meeting, the men were having their own meeting organizing the work teams. The materials should be delivered in the next couple of days if the rains hold off. Almost all the communities have one good classroom but only one. The children who are not in the classroom are housed in makeshift areas that are sometimes only a little tin roof with the rest being completely open. 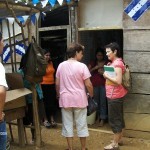 These are photos of the school in Santa Rosita. I was so impressed with the kindergarten kids ( that were housed in what seemed to be a wood shed). 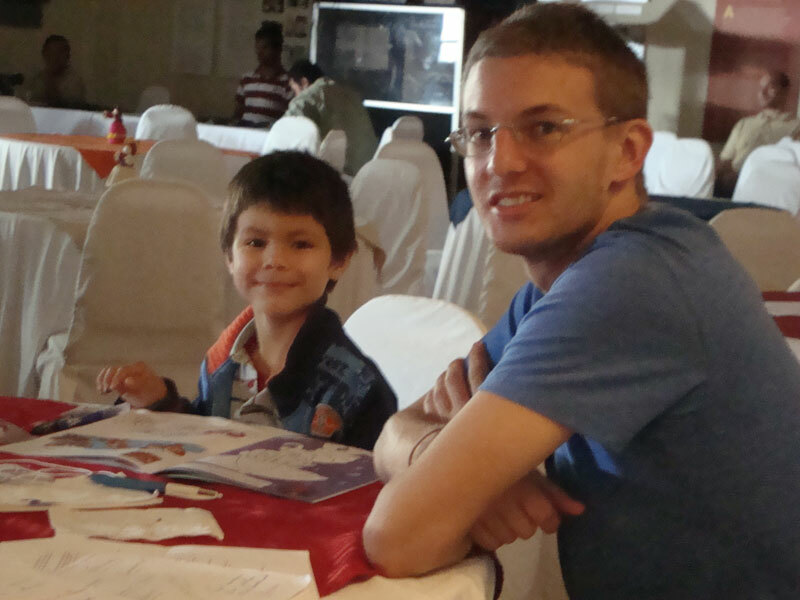 They have a Montessori curriculum that was provided by World Vision and these little 4 year olds could read words. 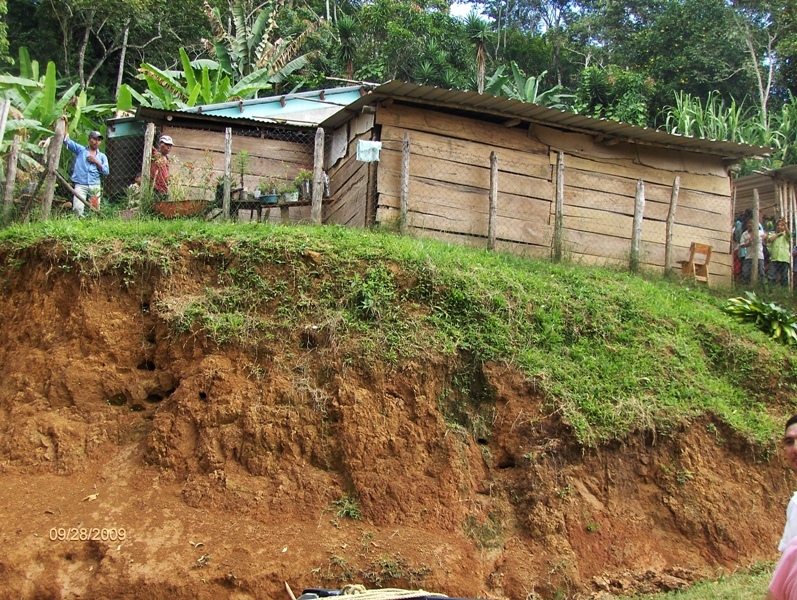 The communities are in the hills, and breathtakingly beautiful. There are huge fincas that grow coffee and chile’s and cardamom and other things. 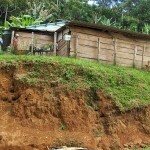 Most of the work available is picking coffee and working on the finca’s. 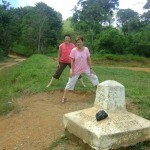 The folks in these two areas are Chorti (indigenous people). It was a most interesting but very long day. 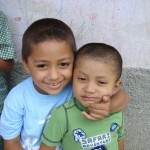 Tomorrow I’ll take some groceries up to the orphange and in the afternoon the bus to San Pedro Sula. I am sitting in my room and feel like I am at a church service. There is a church across the street and I can hear the preaching and the music as if I was actually there. It was a lovely Sunday………mostly an “at home” day. 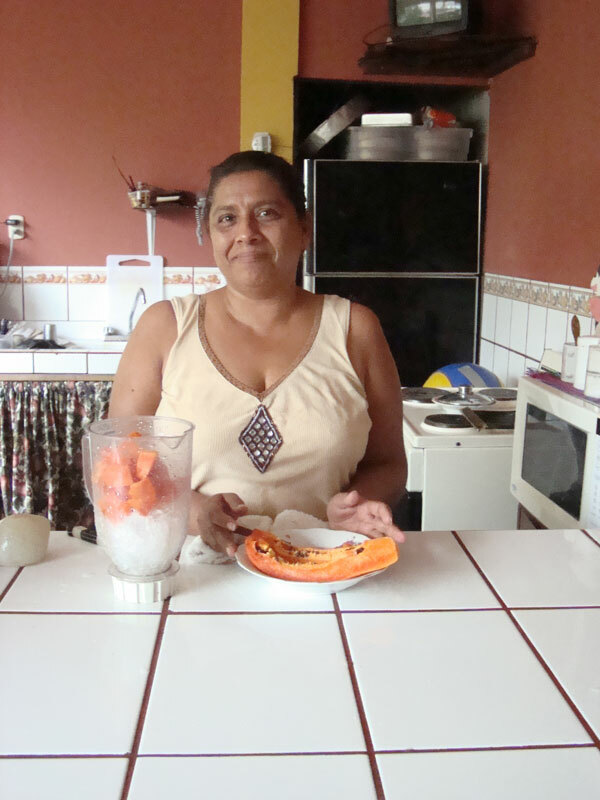 I made chicken curry for the family, and Telma made fresh juice out of Passionfruit. Yum! 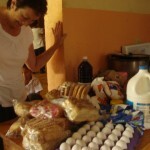 Robert and I met with Dona Delsy this morning to arrange visiting the orphanage today. She had concerns about me buying the children pizza- suggested that it would be a better idea to buy other food that would last longer so that is what I will do. 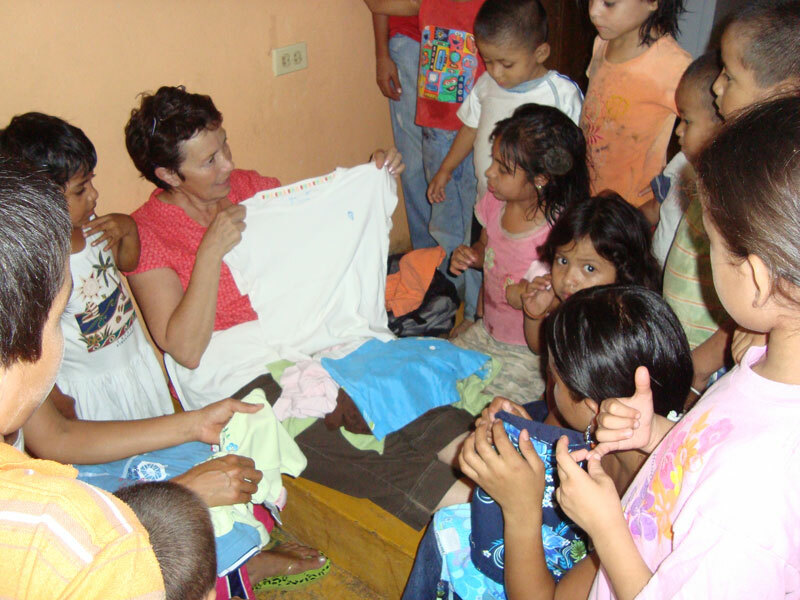 We did visit the orphanage this afternoon and distribute the t-shirts. It was fun. The kids get so excited. 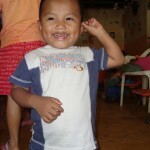 Here are some of the faces of the children at the Hogar Angelitos Felices. It was the last day of the conference. Some of the more notable presentations were about an educational facility that cares for Downs Syndrome kids, Students Helping Students and Global Brigades. 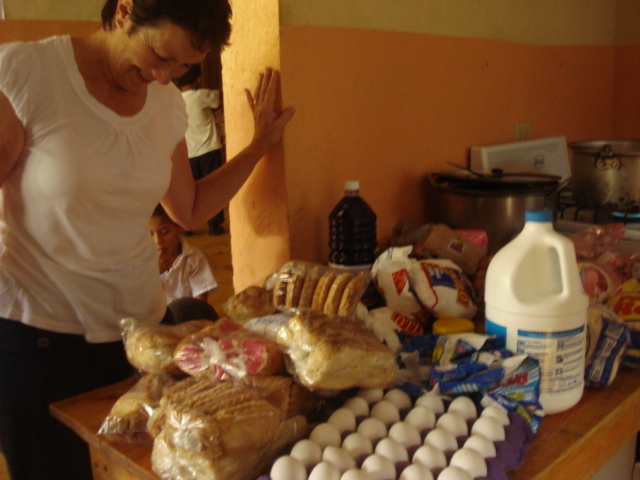 I came away with thoughts of how wonderful it would be to get the more efficient stoves into the aldeas. 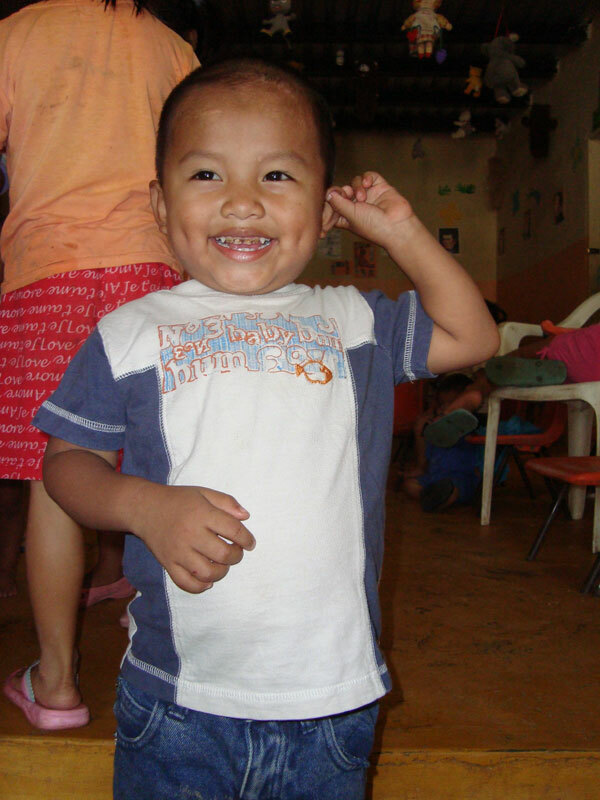 Respiratory disorders are huge here because of wood stoves in the houses. Sometimes they aren’t even vented to the outside so there is constantly smoke in the houses. The stoves apparently use 1/3 the wood and are installed using proper venting. At lunch I met a number of folks who do Brigades here and had a long chat with a retired Episcopalian priest who is looking to do projects with the stoves. YAY! Once again a connection from the conference. 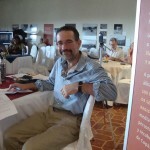 He is in Copan for the next few days touring some of the aldeas so I will try to connect with him. The conference was not without fun. Last night there was a reception with lots of food and drink……AND a marimba band. 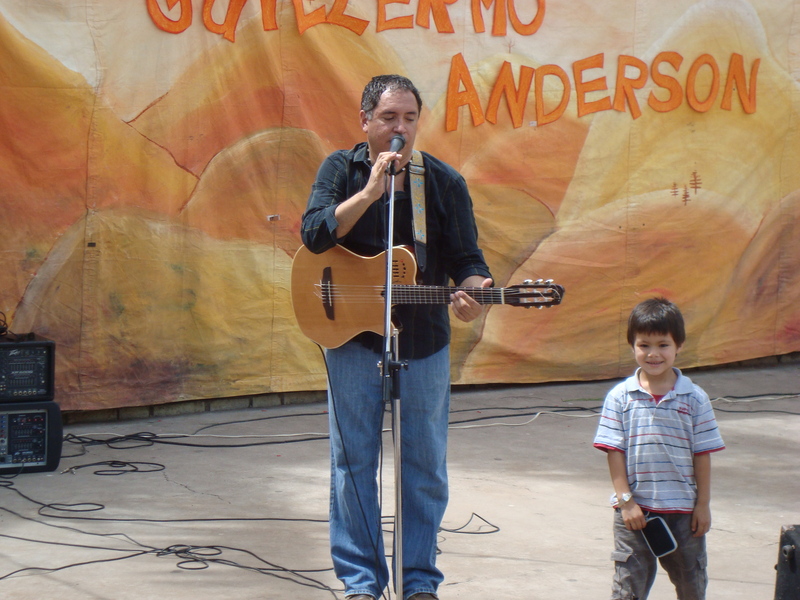 Guillermo Anderson (our keynote speaker) did a concert in the park for the children of Copan. It was wonderful! 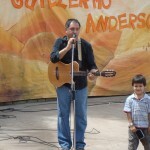 I had thought about going up to the guarderia this afternoon but it rained. It really rained! Downpour actually. Perhaps tomorrow. It was hard to believe but the conference is a success. Even though many of the participants and a few of the speakers couldn’t get here, it went ahead. People made no end of effort to change their plans and flights to make sure that they arrived. 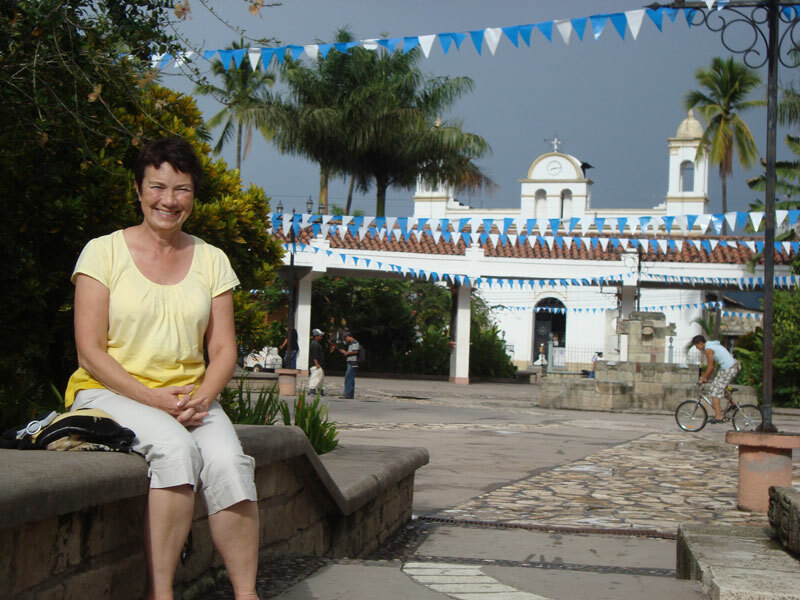 I think that much of the credit goes to Marco Caceres who asked the group yesterday to think of this trip to Copan and the Project Honduras conference as a yearly pilgrimage. It does feel a little like that. The keynote speaker gave what I thought was a clear picture of youth in Honduras. He said that so many young people here don’t know how to “dream”. And, for those that do, the “dream” is centered around what life in the States is like. 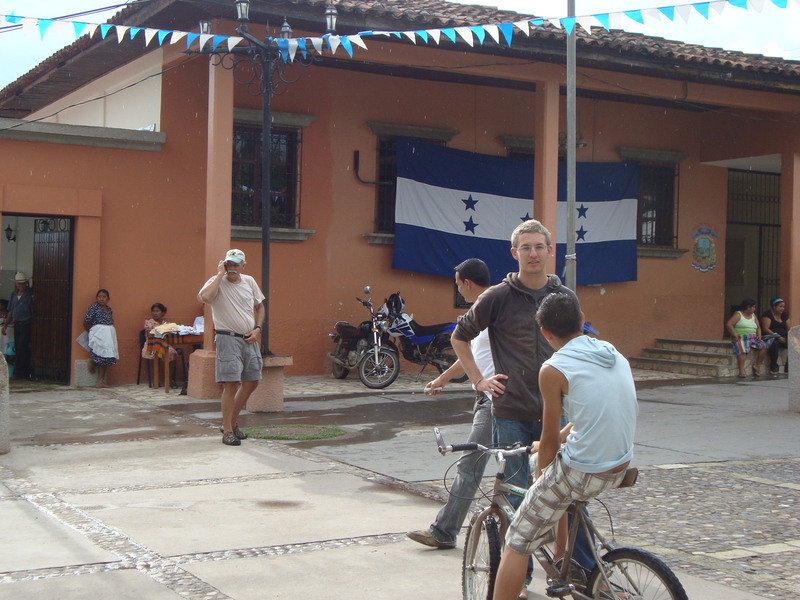 60% of migrants from Honduras are 20-24 years of age. Pretty much a “youth drain”. The other thing that sticks with me is when Marco spoke about people “dialoguing” when in reality what they mean is that two people have monologues and nobody really listens. 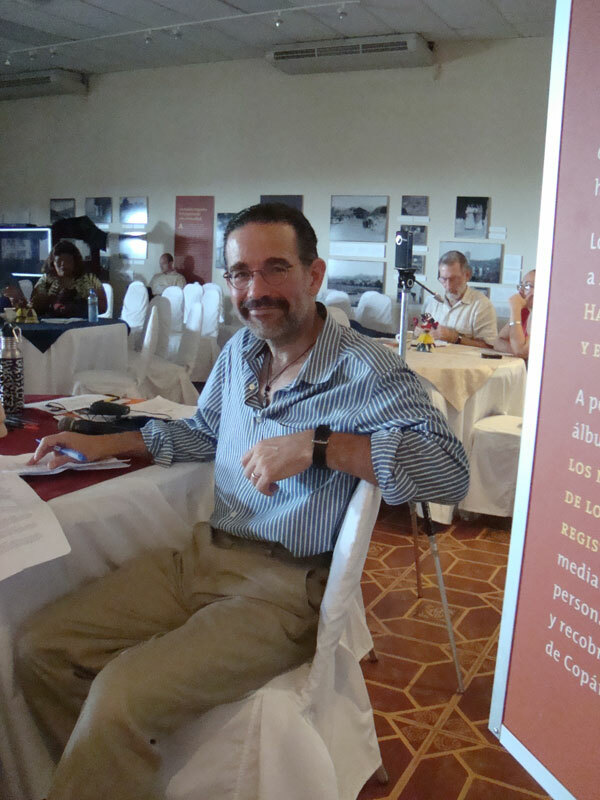 He talked about the Project Honduras conference being a place where people really dialogue. 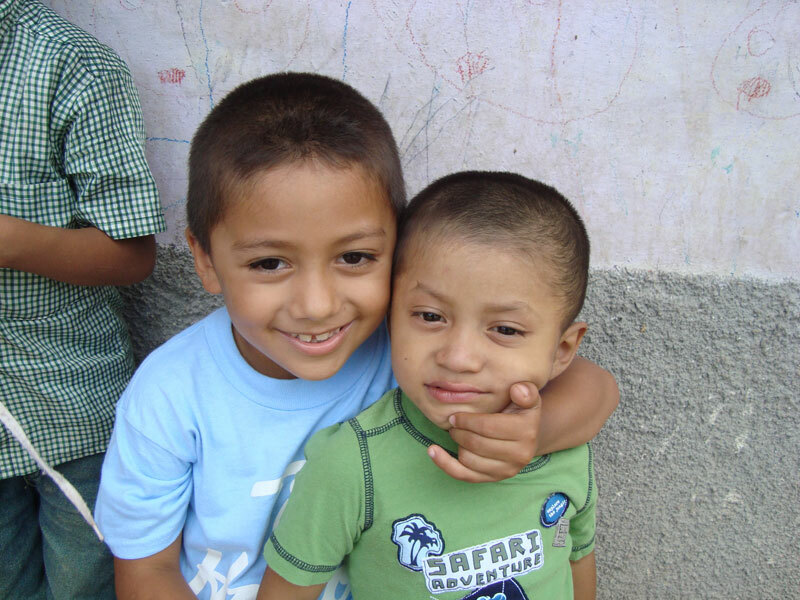 One of the ongoing threads through conversations is “how to have sustainable goals” with the ultimate objective being to have Honduras one day need no outside support. 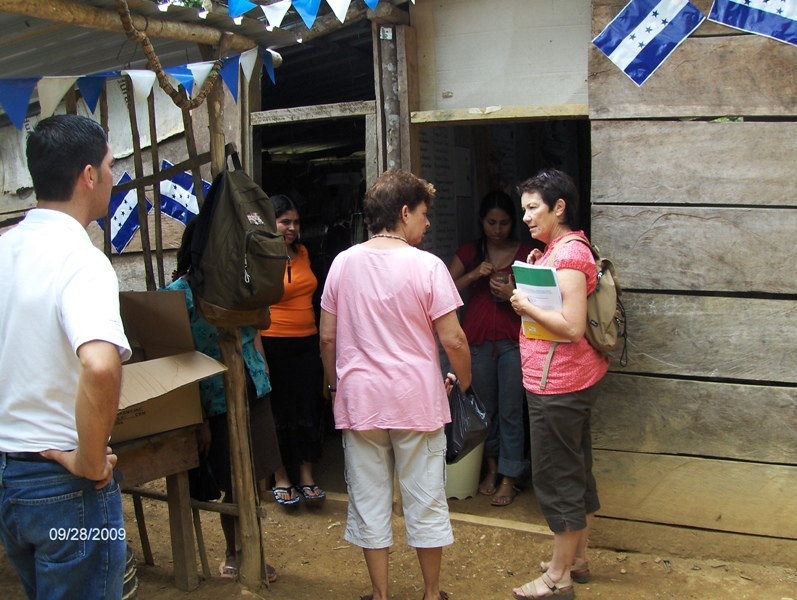 Volunteerism in Honduras is not a common thing so when I think of the participation of the local community in El Malcote in building the school, I am even more pleased. I feel like I have so much to do in these next three days…….. The airports are open again so I think I will wait till Monday to see where it will be best to fly home from.